Avg. Group Discount of 9.3%! 11-Feb-2019 Verified Review, stayed from Tue Feb 05 to Sat Feb 09 2019 at a $177.01 average nightly rate. The TownePlace Suites Fort Worth University/Medical Center is the perfect place to work, live and play. Located directly off of the Chisholm Trail Tollway and Interstate 30, our hotel provides easy access to popular destinations. 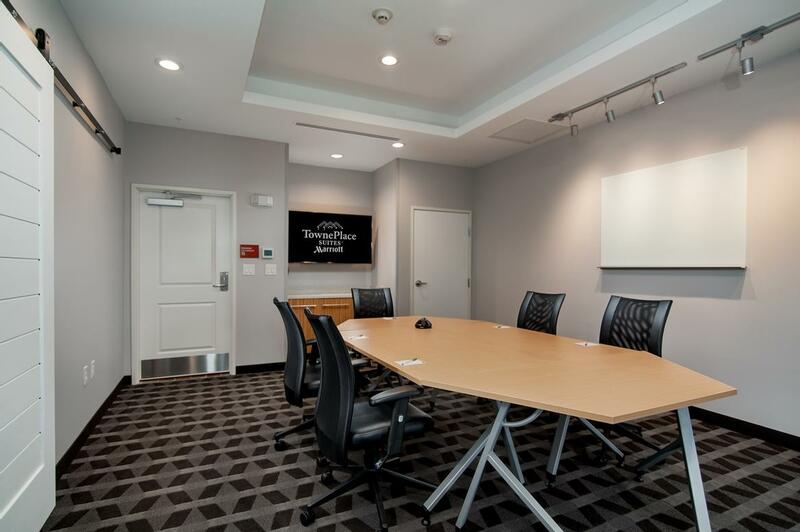 Maximize your productivity with ease commutes to Clearfork, Will Rogers Memorial Center, Texas Christian University, Museum District, Botantic Gardens, Fort Worth Hospital District, and Downtown Fort Worth. Featuring 128 spacious suites with studio and one bedroom floor plans, complete with fully equipped kitchens, LCD HD TVs, and complimentary Wi-Fi access. Fuel your day with our complimentary breakfast served daily. The TownePlace Suites Fort Worth University/Medical Center accommodates both leisure and business guests. Whether you're staying with us for the night, weekend, month or longer, TownePlace Suites by Marriott is designed to provide everything you need to live life uninterrupted. Our staff will make you feel like a local. yes, we recycle and are paperless on receipts. Unless requested. Standard Marriott reservation, 48 hours prior to arrival.Group blocks require 2 week cancellation prior to arrival date. At TownePlace Suites we offer complimentary breakfast 7 days a week, from 6:30am-9am Monday-Friday and 7am-9:30am Saturday and Sunday. You can choose from a variety of options like our signature cracked black pepper fried eggs, a meat option, yogurt, oatmeal, cereal, breakfast muffins, bagels, waffles, variety cheeses, hard boiled eggs, fruit and English muffins. Complimentary parking daily. Large parking lot with room for large vehicles and trailers. Complimentary WiFi throughout the entire building. Hard line internet available in each room. The TownePlace Suites by Marriott highlights above are subject to change without notice. 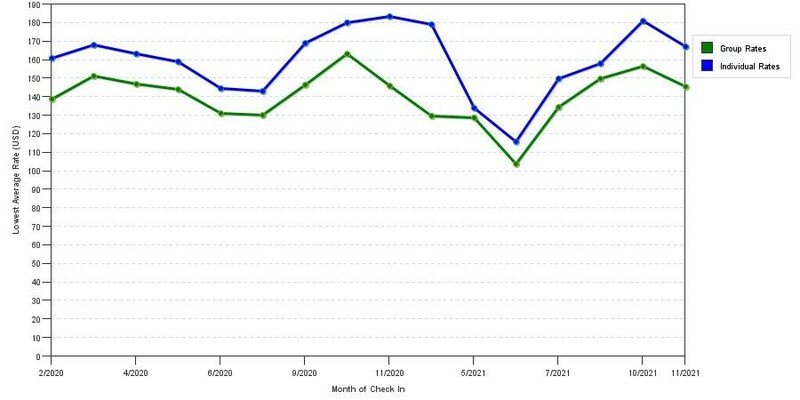 The graph above is fluctuations of room rates for both group/meeting quotes and the lowest online individual prices our system could find at the time the group/meeting bid was entered. The most competitive group or meeting displayed is 23.6% in the month of June 2019 and the highest average individual rate is $182 in the month of June 2019. This chart will show past seasonality and also project future months. If you are flexible with dates, you may want to consider staying at Towneplace Suites by Marriott Fort Worth University / Medical Cen in a month when rates are lower. Below are the meeting, banquet, conference and event spaces at Towneplace Suites by Marriott Fort Worth University / Medical Cen. Feel free to use the Towneplace Suites by Marriott Fort Worth University / Medical Cen meeting space capacities chart below to help in your event planning. Hotel Planner specializes in Fort Worth event planning for sleeping rooms and meeting space for corporate events, weddings, parties, conventions, negotiated rates and trade shows. 25 x 13 x 10 Ft.